PANDAS – a frightening condition, thought to be caused by the common 'strep throat' bacteria, whose symptoms can include tics, obsessions, compulsions and anorexia. Latitudes is the on-line newsletter of the excellent Association for Comprehensive NeuroTherapy, a non-profit American organisation which explores non-drug based, often nutritional, approaches to treating anxiety, autism, attention deficit/ hyperactivity disorder, depression, obsessive compulsive disorder, tics and Tourette syndrome, and learning disabilities. The following article by the parent of a child with PANDAS appeared in their most recent newsletter. Readers might also want to check the very active and helpful forum which Latitudes hosts on PANDAS. My 7-year-old is shouting this at the top of her lungs, standing in her pediatrician’s examination room. Her eyes are fully dilated, she’s terribly scared, frozen in place. Symptoms that started a few weeks ago had now exploded out of control. The nurses are wondering what to do. This is your patient, you idiot! (I think, holding my tongue). This is a child with death ideation, who’s frozen and screaming. She is not having a tantrum, she’s psychotic. This is not normal behavior. She needs help! Where has my daughter gone? It’s hard to explain what overwhelming contamination fears are like in a child, or outrageous rages, or adamant defiant behavior if you haven’t seen someone go through them. It’s hard to explain to someone that the scene at home is much like a weird version of “The Exorcist” movie, and you’d swear your wonderful child has been suddenly possessed. It isn’t just being argumentative, or cranky, or tired. We know those things. It isn’t just unusual hand tremors and odd movement disorders which doctors may refer to as “choreiform movements” while not knowing their cause. It is about your child being so completely stuck in compulsions and obsessions that he or she is literally unable to function. This is PANDAS. Such a cute name, yet the disease is anything but cuddly. Getting the right diagnosis. If you’re lucky. • Anorexia (particularly a fear of chocking, being poisoned, contamination fears). The controversy in PANDAS (and, oh yes, there is a lot) is not about whether the children have the symptoms listed above. The controversy is whether the symptoms are caused by a common bacteria known as Group A Beta-Hemolytic Streptococcus (the bacteria in strep throat). For those who aren’t aware, strep throat is almost universally treated with antibiotics because for about 4% of the population who have the “right” genetics, untreated strep throat can turn into acute rheumatic fever. About 30% of those who get acute rheumatic fever develop Sydenham chorea, and about 70% of those get compulsions and obsessions so severe as to be clinically diagnosed with OCD. Luckily, once treated, the symptoms tend to resolve. Unfortunately, the symptoms often return with greater severity when the person is re-exposed to strep. Acute rheumatic fever and Sydenham chorea and even the OCD that follows are caused by the body trying to fight off the strep infection. In some people, instead of the immune system just attacking the foreign bacteria, it gets confused and can affect heart muscle (carditis), create joint pain (rheumatoid arthritis) and even interfere with how the brain works (Sydenham chorea). PANDAS is thought to be similar to Sydenham chorea but with less of the writhing chorea movements and more of the OCD. The good news in PANDAS is that the condition does not seem to result in damage to the heart. 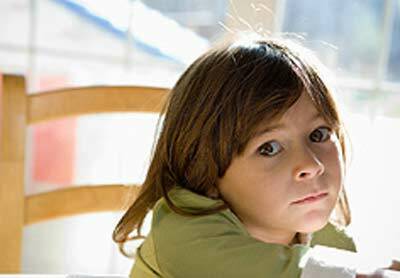 The bad news is that without significant signs of chorea or heart involvement, most doctors will say, “Oh, your child has OCD.” Or, “Oh, your child has tics.” They don’t pursue the possibility of a bacterial cause. They don’t think about strep so they don’t think about antibiotics, the first treatment that should be considered for PANDAS. Back to my daughter. After this psychotic break at the pediatrician’s office, my daughter went downhill fast. She stopped eating, had full-fledged anorexia nervosa, was clutching a school newspaper that talked about sugar in food. She was obsessed. This in a 7-year-old. We got her into the Eating Disorder wing at the local Children’s Hospital. They had never seen anything like it. “What’s causing these movements and obsessions?” I asked. You might not know this but the current standard of care is to not treat asymptomatic children with antibiotics despite a positive strep culture. This seems nuts considering that 4% of children who are untreated are at risk for acute rheumatic fever, but that’s how the math works (less than 1% of children would be affected). Unfortunately that 1% included my child. I sit there trying to get antibiotics for my daughter while the doctor is telling me about Risperdol for tics, antidepressants for OCD, and Ativan in an attempt to stabilize mood. I can’t believe they wanted to put her on drugs that are off-label for children. Worse, they weren’t planning to treat the strep infection that was right there when Sydenham chorea, OCD, and acute rheumatic fever are all tied to untreated streptococcal infections. The doctor relented on antibiotics and my daughter improved dramatically within 24 hours—not 100% better, not normal, but she could eat, she could touch things, she smiled for the first time in a month. Then she got worse, way worse. I took both kids in and my other daughter tested positive for strep. Arggh! We treated both kids and again symptoms declined significantly. It took another 6 weeks for the motion abnormalities to go away. Despite all of this I was still worried. . . .
What might happen if she gets strep again? Will it all come back? Will it be worse the next time? I asked my doctor about prophylactic (preventative) antibiotics. He said no. Conventional medicine says: Current research indicates that prophylactic antibiotics are not necessary because critical organs like the heart are not affected in PANDAS [Shulman2009]. Ah, did they forget the brain, that other critical organ? “We want to treat only active infections so we don’t accidentally create bacteria that are resistant to antibiotics.” Can you tell by this point that I don’t care? I just want to cure my daughter. I ended up searching and finding a doctor who would treat my child’s PANDAS—finally. It’s not really the doctors’ fault. They are trying to follow a standard of care. The problem is they don’t know all the evidence, and for good reason. Some of the best evidence of linking PANDAS with streptococcal infection came out in only the last four years [Kivan2006] [Yaddanapudi2009]. This is just yesterday in the medical community. Other researchers are still trying to replicate these experiments. There remain huge debates about how to diagnose PANDAS, confusion about the meaning of certain antibody tests, disagreement about whether PANDAS is just weak Sydenham chorea, concern that improvement is just a placebo effect. We can certainly join the scientific debate, but frankly it isn’t that fruitful. Despite PANDAS being the first major clue in ten years into what might cause OCD and tic disorders, it’ll be at least another five years before the research stabilizes. Beyond antibiotics, there are helpful treatments for PANDAS that work on the immune system. New studies and advances are underway, and there are many great success stories. There’s definitely hope for a return to normal life, and the sooner a child is diagnosed the better. The family is the first line of defense for the PANDAS child. You know your child better than anyone. You’ll recognize the symptoms long before the doctor. But, be prepared to hang in for the long haul, as you may have to fight to get the proper treatment for your child. It still amazes me that it’s sometimes harder to get a strep culture than to be prescribed dangerous antipsychotics. If your young son or daughter has some of the symptoms described above, like daytime urinary frequency, massive separation anxiety, contamination fears, anorexia – and these are dramatically interfering with daily life, get a strep test (and test the siblings too). Learn about PANDAS. And find a specialist who knows how to treat it. [KIRVAN2006] Kirvan CA, Swedo SE, Kurahara D, Cunningham MW (2006). "Streptococcal mimicry and antibody-mediated cell signaling in the pathogenesis of Sydenham's chorea". Autoimmunity 39 (1): 21–9. PMID 16455579. [MORETTI2008] Moretti G, Pasquini M, Mandarelli G, Tarsitani L, Biondi M (2008). "What every psychiatrist should know about PANDAS: a review". Clin Pract Epidemol Ment Health 4: 13. [SHULMAN2009] Shulman ST (February 2009). "Pediatric autoimmune neuropsychiatric disorders associated with streptococci (PANDAS): update". Curr. Opin. Pediatr. 21 (1): 127–30. [SWEDO1998] Swedo SE, Leonard HL, Garvey M, et al. (February 1998). "Pediatric autoimmune neuropsychiatric disorders associated with streptococcal infections: clinical description of the first 50 cases". Am J Psychiatry 155 (2): 264–71. [YADDANAPUDI2009] Yaddanapudi K, Hornig M, Serge R, et al. (August 2009). "Passive transfer of streptococcus-induced antibodies reproduces behavioral disturbances in a mouse model of pediatric autoimmune neuropsychiatric disorders associated with streptococcal infection". Mol. Psychiatry. doi:10.1038/mp.2009.77..
Hi, I read a piece you wrote about PANDAS (Pediatric Autoimmune Neuropsychiatric Disorder Associated with Strep) and just wanted to let you know that a fairly large subset of children have an offshoot diagnosis of PANS (Pediatric Autoimmune Neuropsychiatric Syndrome) which is basically PANDAS but triggered virally as opposed to triggered by strep. In addition, a large amount of those children are affected (meaning increase in frequency or intensity of symptoms) by food additives, chemicals and gluten/ dairy sensitivity . My son is one of these children, and Coxsackie virus specifically wreaks havoc on him...he literally lost 3 months the last time he had Coxsackie – with intense exacerbation of both cognitive and physical symptoms. Thank you for reporting on PANDAS and hopefully PANS as well. These children need more people to be aware of these syndromes in the hopes of improved symptom management and faster diagnosis of new cases.